NOTICE: As of May 1, 2016, Copy is no longer in business. Check out our Product Selection Tool to find a different vendor. Copy storage provides cloud-based file syncing, sharing, and storing services to individuals and businesses. Its services include uploading, sharing, and storing of documents, images, and video while providing businesses with enterprise-level security and user/group management functions. 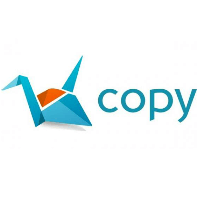 Copy specializes in simplifying communication with secure, user-friendly cloud sharing and storage solutions. Copy is powered by the Barracuda cloud, which enhances its security by offering multiple layers of encryption during transfer and storage, source validation, and identity verification. Its platform is compatible with multiple operating systems including Windows, Mac, and Linux. Additionally, mobile device support is available for Apple and Android systems. Copy features a “no limit” file sharing policy that eliminates barriers to sharing large files either privately or publicly. Additionally, Copy uniquely offers a “Fair Storage for All” program, which allows users to choose which files count against their storage limits. The company’s referral program incentivizes referrals to the service by awarding additional storage space. Moreover, Copy offers a “no-per-user-fee,” which provides affordable cloud solutions for businesses of all sizes. Copy appeals to businesses looking to establish a secure, flexible, and user-friendly storage and sharing solution, although the company also offers packages for personal use. Copy has helped businesses streamline communication and boost efficiency while offering enterprise-level security, support, and user control functions. Businesses that have moved to cloud-based sharing and storage systems experience a reduction in costs, improved security, and enhanced operational efficiency. Learn everything you need to know about Copy. Our experts will reach out to you shortly.